A significant focus of the 2019 Budget is ‘Reconciliation through Economic Development’. The section dedicated to it is rife with avenues of debt relief for communities in the Northern and Eastern Provinces, and simultaneously injects money into Government-run reconciliation initiatives. This article is an attempt to analyse these allocations, assessing their practical impact for populations most affected by the conflict, and how they factor into the Government’s long-standing promises for ‘reconciliation’. As Sri Lanka closes in on 10 years since the end of the armed conflict, it is necessary to question why affected populations continue to struggle with neither sustainable economic support nor meaningful measures towards reconciliation from a Government that has repeatedly promised them both. The focal point of ‘Reconciliation through Economic Development’ in the Budget is the extension of Government-run micro financing to the north and east. This is done through the acceleration of the Enterprise Sri Lanka (ESL) scheme and with corresponding debt write-offs (which the Government began in 2018). The criteria for these write-offs, however, are prohibitive and leave untouched those worst affected by micro-finance debt, especially single working mothers who are the heads of their households – the Household Income Expenditure Survey (HIES) for 2016 puts the number of women-headed households in the north and east collectively at nearly 180,000. The Central Bank’s minimum limit to qualify for a debt write-off is Rs. 100,000. A large number of indebted individuals, however, have taken out far smaller loans later to pay off their earlier, larger ones and thus would not be able to access this relief. Similarly, ESL bars those who have outstanding debts to other finance companies, meaning that individuals with loan amounts from non-Government entities that do not qualify for the initial write offs would be barred from seeking loans through this process as well. 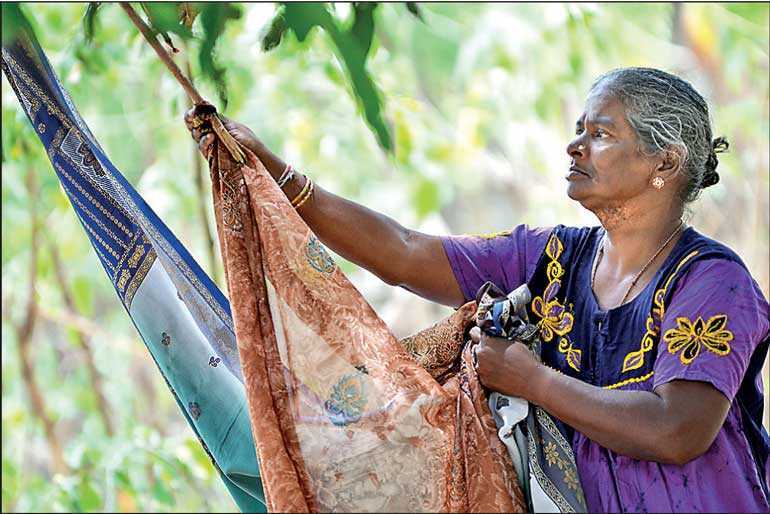 As such, these measures leave those most reeling from the microfinance crisis, such as the single working mothers who are the heads of their households, and who are indebted multiple times over to predatory loan companies from taking out numerous smaller loans to pay off existing larger loans, locked in their predicament. The Budget instead most benefits middle to upper middle-class individuals who have a single line of credit (for larger scale entrepreneurial ventures) and are not indebted in multiple places. On the extreme end of the Budget’s benefits to the least vulnerable is the tax concession bestowed to investors of up to $ 3 million in depreciable assets, which, at 200% for investments in the Northern Province, is double the 100% concession for the other Provinces. This is essentially a tax write-off with an equal amount as a bonus on top, clearly aimed at wealthy individuals and finance companies, not the ordinary citizens worst affected by the conflict. While this budget has been characterised as a budget of ‘handouts’, it can be seen more specifically as one of handouts for the least vulnerable. The budget also begins a process of folding in the formal transitional justice mechanisms into the Government microfinance regime. It commendably allows the Office of Missing Persons to provide families of missing persons with a monthly allowance until the Office for Reparations begins functioning. These families, however, are also to be given preferential access to the ESL scheme. This signals that the Government’s primary solution of ‘economic empowerment’ to those worst affected by the conflict is loan-powered entrepreneurial schemes. It also paints a picture of what a future reparations programme under this government would look like – the thrust of reparations is likely to resemble a doubling down on micro finance and debt concessions. Beyond half-baked financial schemes, the budget provides very little in the way of actual job creation, through for instance industrial or agricultural production investment in the north and east. There is a miniscule Rs. 200 million allocation to scale up toddy bottling and jaggery production through cooperatives. For comparison, more funds have been allocated to develop playgrounds and the National Art Gallery (Rs. 300 million each). Importantly, the budget also does not address the ban on toddy tapping on all trees except kithul that the Government itself imposed in 2018. The only other job creation initiative in this part of the budget is a proposal to scale up producer cooperatives to “urgently create jobs” in the rural economy. Alarmingly, however, this budget item has no monetary allocation attached. The only actual monetary allocation for cooperative societies here pertains solely to debt relief. The Government lumps together some of the most pressing social needs in the north and east – such as psychosocial support and addiction counselling – into the ‘Palmyrah Fund’. While it has a large Rs. 5 billion allocation over two years, there is scant detail on its entire framework. For instance, it is to be administered through the Treasury across Government Agents in, ambiguously, ‘war affected areas’; and there is no clarification on whether it will fund existing programmes or new ones; how the disbursements will be monitored; or how their impact will be analysed. This is all the more concerning given that no national government policies exist on a number of the areas that fall within the fund. Further evidence of the magical thinking behind the Fund is the encouragement for ‘well-wishers’ and ‘philanthropists’ to sustain it, as well as, ambitiously, ‘the diaspora’. Wishful thinking along these lines is repeated in the budget’s allocations to the Office of National Unity and Reconciliation (ONUR) – for its schools and arts and culture programs – and to the Secretariat for Coordinating Reconciliation Mechanisms (SCRM) – for its communication and awareness programmes on reconciliation. While both ONUR and SCRM have been in operation for a number of years now, little assessment has been done on the impact of their work. ONUR’s liberal peacebuilding initiatives take a finger painting and smiles approach to ethnic division but do not undertake the vital structural reforms necessary to rebuke Sinhala ethno-nationalism and its proponents. Similarly, SCRM has been virtually absent in print, televisual and online media on crucial and ongoing debates on transitional justice mechanisms and Sri Lanka’s international commitments. Both institutions leave untouched actors who could be focal points for long term change, such as religious leaders, media networks and education policy makers. It is unclear then, what pouring more money into them could substantively achieve. Coupled with the seeming lack of political will to meaningfully tackle the root issues of ethnic conflict, the allocation of large sums of state funds to essentially cosmetic acts of ‘reconciliation’ shows how far away the concept is from being realised meaningfully. Across all these areas, the Budget offers very little of substance or hope to the north and east’s people. It offers micro financed entrepreneurialism as the solution to all the regions’ economic troubles, and goes on to leave their most vulnerable citizens, brutalised by the war and now debt, out of even that. Correspondingly, it does little to create jobs and provide stable incomes. Finally, it band-aids the region’s numerous social problems, and the country’s own deep divisions, with poorly thought out or dismally functioning measures. 10 years on from the end of the war, the Government in sum offers little more than a disinterested shrug to the north and east’s people who deserve so much more.